Uppsala University Library has been given funds for cataloguing and digitisation of the Joel Eriksson Collection. Photos from the collection are mainly requested by researchers from Mongolia, China and Japan. For these scholars it is of great interest to have the photos available in digital form in the database Alvin, with extensive metadata in English. Joel Eriksson, born in 1890 in Huddunge, Uppland, travelled in 1913 to Mongolia as a representative for the Swedish Mongolian Mission. There he worked until 1938, and documented people and life with his camera. 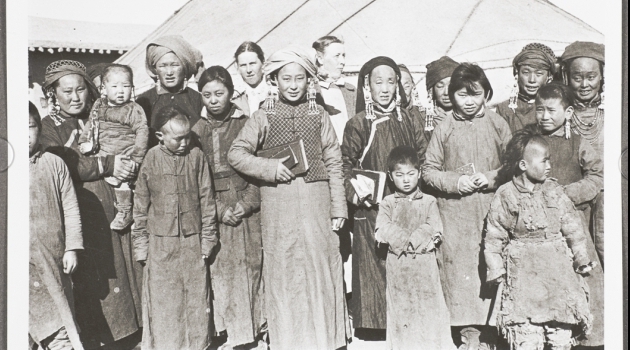 On his way to Mongolia he met his wife to be Annie, also a missionary. Their daughters Svea and Vera were born in Mongolia and their son Paul was also raised there. Due to political circumstances the family returned to Sweden and Uppsala in the 1930s. Joel died in 1987. The application for funds has been made in cooperation with Staffan Rosén, prof. em. in Korean language and culture. Staffan mediated the Joel Eriksson Collection to Uppsala University Library. He will also help with identifying the motives in the photos.